Following up on last week’s post (Product Photography, Part 1 – Cameras), today we’re taking a closer look at the lighting and background set-up needed to get those perfect product pictures. In my opinion this is actually the most important post in this product photography series and it’s something most sellers completely overlook. But with just a little education on the subject, you’ll be able to create a mini photo studio that helps you create stunning product pictures! So without further ado, let’s get started. To create beautiful product pictures, you need to use some sort of background. Why? Well to get rid of distractions and background ‘noise’ and allow your product to be the only feature of your pictures. Okay, if you’re selling something like a car, you won’t need to put it on a white background, lol, but in most cases you’ll want to use it – be it for small, medium or large products. If you take a look on eBay, you’ll find plenty of amateurish looking pictures of products on wrinkled bed sheets and while this may be okay if you’re just selling some unwanted items from around your house, business sellers should really take more care in how they present their products. And the key to this is a good background set up! The first thing that comes to most people’s minds are so called Lightboxes – you can get them on eBay and online shops in various sizes and settings – with the cheapest starting at just £20 or so and the most expensive, super-sized versions costing several hundred pounds. Here’s the thing – You DON’T NEED THEM! That’s right; you don’t need to purchase a lightbox to take outstanding product pictures. I’d actually recommend you stay away from them as they will only complicate your life, seriously! Theoretically they work ok BUT only if you have very powerful lights to get the box well exposed. And even then, I can’t see any reason why you would want to use a lightbox at all. I have purchased several of them in the past and after some trial and error, haven’t touched them. Have you ever seen any professional photo studio that uses lightboxes? I haven’t either and there must be a reason why professionals don’t use them – they’re more harm than good with the wrinkles and shadows they create. 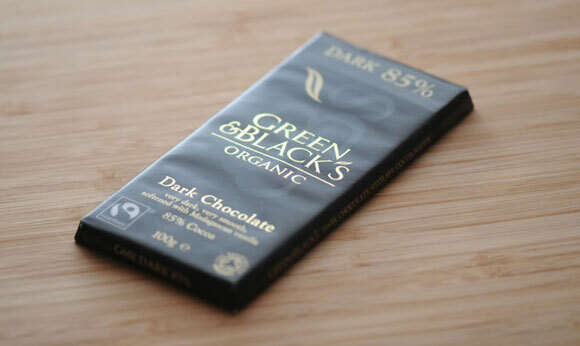 To create a seamless background for your product photography set-up, all you need is a large sheet of paper or fabric. That’s it! In most cases paper will work best as it has no wrinkles and is very cheap to buy + you can get any colour you want. Fabric can also be used but only if you want to create some sort of special effect, like a textured background. 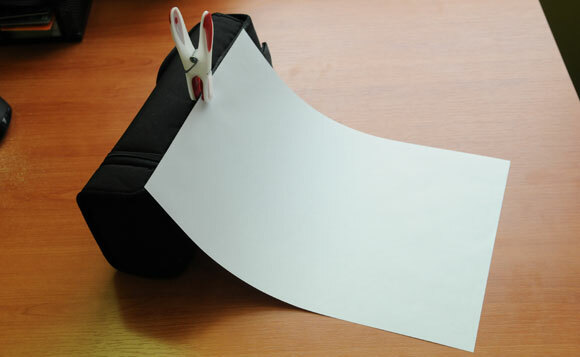 For small to medium sized items, simply get as big a sheet of white paper as you can find. Most craft shops carry these in sizes up to A0 (118.9 cm x 84.1 cm) and if you’re lucky you can even find 2A0 or 4A0 sheets, which are gigantic. But for most people A0 is all you really need. And here’s what you need to do to create a quick studio set-up – use a chair, table (surface) with something behind it (books, DVDs, boxes – whatever) so you can lay down half of the sheet on the surface and align the other half vertically to create a seamless transition from front to back. Secure the top side of the paper with paper clips or clamps. There are special stands you can purchase online if you want but seriously, you don’t need them! If you put this little set-up together from stuff that’s already in your house, then you keep the cost down and most importantly; can then customise your set-up whenever it’s required. That’s all there is to it really – this may look too simple to work well but trust me, you don’t need anything more to take superb product images for your eBay or eCommerce shop. The key elements are a pure white background, no hard corners/edges and a seamless transition behind the item. 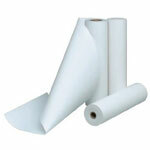 For larger and bulkier items, when A0 size paper is too small, you will want to buy a larger paper roll. This is the same thing used by professional photographers in their studios and can be freely purchased online. Expect to pay £40-£50 for a roll that will last you decades. Various sizes and colours are available from online shops like Photography-Backgrounds.co.uk and many others. You’ll also find stand systems there which will make your life much easier when handling such large backgrounds. Or just search for them on eBay as prices will be cheaper. If you can’t afford to buy a stand, simply create one yourself. All you really need is some way to attach the paper to your ceiling and then you can simply roll it out onto the floor to create that curved angle. 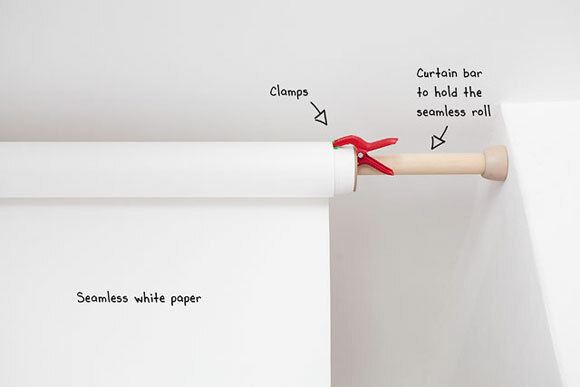 Expandable curtain bars can be used for this, as showed in this guide! There are also vinyl and fabric rolls available but they will be more expensive and suitable more for people photography rather than products. And again, you don’t really need them unless you want to create a specific effect. This is a set-up you can’t go wrong with. Obviously, you’re not obligated to stick with this and if you really feel that you must use PINK instead of a white background, use it! Just be careful not to overdo it. White still works best in 99% of cases so maybe it’s best to stick with what works? In some niches though you may want to experiment a little bit to create a unique look for your images. This can be especially worthwhile on eBay – for gallery images. Since no text and graphics are allowed in gallery images, the background is something you can use to stand out from the crowd. For example, you sell widget X with 30 competing listings – all using a white background. You could use a different colour/material background to make your pictures stand out in the search results. But be careful – you definitely don’t want your item to get lost in the background – the product should still be clearly visible and the focus of your pictures. Wood is perfect for emphasising the organic/natural feature of a product. This could be organic food (like in the example below) or handmade jewellery. Tiles are perfect for creating an interesting reflection effect. For example, black gloss/shiny tiles are perfect for jewellery, watches and other metallic products as it will create a reflection in the images. All you need to achieve this is one large floor tile, with a gloss finish. An even more interesting effect can be achieved with stone materials or gloss tiles with stone designs. These would be perfect for bathroom accessories and similar products. So while white and black paper is your number one choice, using other materials and colours can be great way to create unique product images that will stand out in eBay’s search results as well as feature your item in the environment which suits it best. So that’s the camera and background sorted. What else is needed to create stunning product pictures? LIGHT! The more you can get the better (up to a certain degree). Lighting is that one thing most newbie sellers don’t pay attention to AT ALL and it’s the reason their product pictures turn out dull, blurry and with lots of shadows. Not anymore! By following this guide you’ll be able to set-up your home studio in the same way professionals do, just without the high price tag. You’ll need to invest some money though as unless you’re ready to go for the FREE option (taking pictures outside, which we’ll cover later), without buying some sort of equipment, it will be very hard to achieve decent results. Most cameras come with a built in Flash. The bad news however is that they are not suitable for product photography at all, particularly with smaller items. Built in flash systems simply don’t deliver as much light as you need in product photography + it distributes light un-evenly, creating shadows around your item – which is something you definitely want to avoid. This is the best option if you can afford it. These are similar systems to ones used by professional photographers. Obviously, they use more expensive and more powerful branded kits but for product photography even these cheaper China made sets are perfectly fine. The way these flash kits work is that you attach a receiver to your cameras flash mount shoe and it will “communicate” with all strobes simultaneously and fire them when needed. This set-up will only work if you have a DSLR camera though as compact cameras usually don’t have hot shoe connectors for external flash units and even if they do (some models); chances are they won’t be able to communicate with such a complex set-up. The best place to buy such a kit is on eBay – you can get starter packs for as cheap as £150 and more advanced kits for around £200. What to look for in such a kit? * How powerful is the flash output, in watts? The more the better really… 200-300w PER flash head is ideal. Don’t worry – there’s no such thing as too much as these flash heads have variable power adjustment which lets you manually adjust the output power (for close up pictures for example). * How many flash heads there are in the kit? You’ll need 3 (right, left and top). 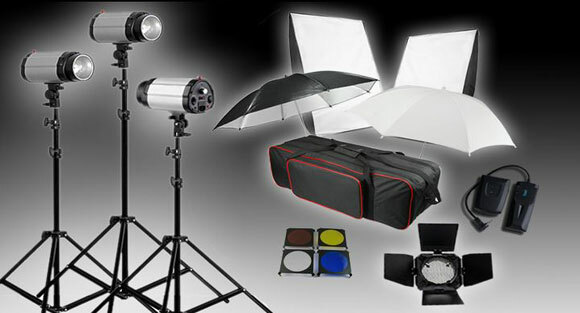 * Soft boxes/umbrellas. These help distribute the light evenly so are a MUST HAVE accessory. I like umbrellas more than soft boxes as they tend to give more light. * Stands. 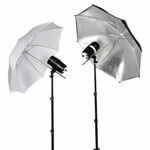 Ideally stands for the flash heads and soft boxes/umbrellas should be included so you don’t have to buy them separately. Perfect kit for product photography. Click Here for this eBay listing. So this would be the perfect set-up for any online seller. This is a one-time investment in your business so think twice before opting for a cheaper alternative. Obviously, for some people; even £150 is too much to spend on a lighting kit right now, so what to do? 2) Use regular lighting fixtures with powerful daylight bulbs! 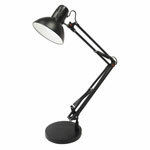 It can be a desk lamp or a clamp-on lamp – either will work just fine. The bigger the reflective area of the lamp and the more powerful the bulb, the better! With bulbs be careful though – you need the “DAYLIGHT” type of bulbs that produce 5500K (white light). If you use traditional bulbs, they’ll produce a yellowish colour light and many LED bulbs will produce a slightly blue-ish tint. Just tell the sales person that you need daylight bulbs, as powerful as you can get (just read the label and make sure your fixtures can accommodate what you’re buying!). 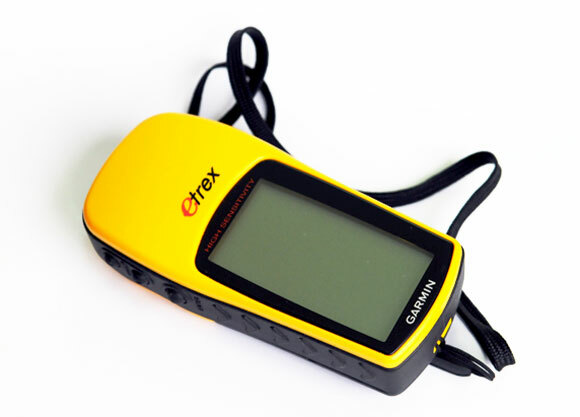 If you’re buying these online, most sites will have the colour temperature in the product descriptions. In total you’ll need 3 units – right, left and top. You’ll also need to figure out how to position them properly – so a cheap tripod or other stand is a must have. We’ll talk more about positioning of lights in next week’s article. Yep, the last option would be to simply take your product pictures outside and use natural lighting. You don’t even need a sunny day for this (plenty of them in the UK, right?) – as even on cloudy days there’s usually enough light outside to take good pictures and with a little editing you can get pretty decent results this way. The downside to this is that you obviously have no control over your set-up – if it rains, you can’t take pictures. I also wouldn’t want to do this in winter…. but for some people this may work, especially if you live somewhere else other than the UK. You can actually use natural daylight WITHOUT leaving your house. What you do is simply position your photo studio nearby a window, so that you get plenty of light from it. This will work best on sunny days when it’s bright outside but unfortunately on cloudy days you just won’t get enough light coming into your room. We’ll talk about this more in the Editing lesson (Part 4 of this series) but for now, just so you know, you don’t have to get your images looking perfect on your camera. Lots of things can be adjusted afterwards using photo editing software. For example, your lighting set-up may create a slightly greyish look – that’s not a problem as in most cases that can be adjusted afterwards using Levels and White Balance functions. Whatever you do, get lighting right as it will then be super easy to get good pictures even with cheaper cameras (possibly even smartphones!). A good lighting set-up means that the item is evenly lit, with NO shadows around it (hence why we use three light units – right side, left side and top) as it will be difficult to remove shadows later on. Next week we’ll take a closer look at the actual product photography process, how to allocate lighting units, what settings to use, how to handle your camera and much more! I have come across your website and think its very interesting and structured well. We have recently purchased a Phot-R 2x 850W Photography Studio 50x70cm Softbox Continuous Lighting Stand Kit with 200w 220v 5500K bulbs and since setting this up with our light tent we need extra light to go over the top (As mentioned in your post). After searching on ebay and phot-R site we can’t find an single additional continuous light unit kit which goes with thePhot-R 4m Heavy Duty 2-in-1 Rotatable Boom Arm Light Stand Kit. Please advise on a over top light as I don’t want different lights giving different shades out. Unfortunately, I won’t be able to give any advice on this as I don’t do product photography anymore… In fact, I sold my equipment years ago and completely switched to outsourcing. Nowadays you simply can’t get the quality of images you need in home/office studio like this… at least without spending an awful lot of time on it. I rather pay a professional to get this job done at a level I was never able to achieve on my own. Sorry, not much of a help, I know. IF the product and background are lit enough, the greyish colour won’t be a big problem – you can easily get rid of it via Photoshop Elements when doing editing. The important part is to have enough light so that you don’t have dark shadows in the background and product is perfectly lit from all sides. I’ve seen 6500K lightbulbs for sale, are they even better than 5500K? Hi Andrew, excellent writing. Actually, most of the time I use my phone to capture my product photos as I don’t know the proper use of DSLR till now. But I think phone is not good enough to have good pictures. Can you recommend me some cameras that I can buy to do my product photography? Any entry level, latest Nikon or Canon DSLR camera will be good enough for product photography. The more, the better! You can always move lights further away from the object but I would say some 1500 watt kit will be enough! (500w each bulb – right, left, top). Whatever lights work best for you, as long as they’re “day-light” spec lamps. Yes, you can use soft boxes that way BUT ideally you would have two more/small ones you can use close to item, on both sides to eliminate any shadowing. Thanks Andrew for sharing all this. Its great to know, has add value to my to be start business. I will take all of the information in account. – Is plotter paper (white paper, 80gr) suitable for product photography? – Is seamless paper different? Yes, 80r paper should be fine, as long as it’s pure white. Yes, seamless paper would be better as it has non-reflective surface. I finally figured out how to make the background of my product pictures pure white! First, it helps (but is not required) to set the white balance of your camera. It really doesn’t matter what lighting you use; I use about 10 CFL bulbs and over expose my shots by two steps. So take a picture of a pure white background and set that as your white color. Then, affter you take your picture, analyze the actual color of your white background using the free and excellent ColorCop software. With this tool you you can place an eyedropper anywhere on the image and it will give you the exact R,G,B values. Pure white is 255,255,255. Next, open the image up with the free and excellent FastStone Image Viewer. This software has an “adjust colors” function (move the cursor to the left of the screen for a pop-up menu). Simply increase each of the R,G,B values to get 255. For example if your RGB was 234,247,248 you would add 12 to red, 8 to green and 7 to blue. Then save your image with the new adjustments. Your background will now be pure white. Thanks for sharing this Gerald, excellent tips! First of all, thanks for sharing this valuable information. I’ve looked for a while for a detailed guide on how to take professional looking product pictures and you’ve done an amazing job ! I started with a lightbox kit sold on Amazon and quickly realized that the 2×15 Watts lamps provided with the kit was a joke. I bought 2 new lamps of 2×55 Watts (5500k), but it still feels like it’s not enough ! I’m shooting sunglasses, and it’s a nightmare to shoot black models… Never enough light so I ended up putting my 2×15 Watts inside the box ! I’m using a DSLR (Nikon D60) with the original lens. For a while, I thought the issue might be with the lens… that maybe I needed a macro but the cost is just ridiculous… Do you think it’s really necessary? I’m considering going with strobes now and getting rid of that box… Would you advise also getting these shooting tables or are they unnecessary? Anyways, thanks again for the valuable and actionable information you are sharing on your website (I wish I read you post sooner!). No, your standard lens is not the problem. Lack of light is. So you should get much better results with strobes. And no – you don’t need a shooting table – just use a large piece of white paper, just like in my example as a background and get decent lights. My name is Oren, and I am a seller in the jewelry field, at the moment I takephotos of my products through the iPhone without any accompanying accessories. In order to improve the images I want to buy a better light accessories, but I feel confused all the products that field. They have various products/accessories for jewellery photography as well as very detailed guides. I have found florescent bulbs (5500k are the ones i am using) are a little easier than strobes. I had initially tested with strobes however had a hard time getting my camera settings right for shooting with the strobes. Through trial and error with my continuous florescent bulbs, I was able to dial in the correct camera settings. Another thing your users might find useful that really helped me was a photography software by a company called Iconasys that allow me to shoot my images through a computer. It has been especially beneficial to my process time allowing me to increase my product photography throughput (im shooting about 50 products a day for my ebay store). I did try the soft that came with the camera – Camera Control Pro to take pics using a PC. It was ok but since I purchased the remote control, I just started using it and it’s still quite convenient. Thanks so much for your posts on product photography, I have found them very useful! I just have a question regarding lighting. I am using regular lamps and before reading your article I was looking to purchase some 6500K daylight bulbs that I found online but you mentioned to use bulbs that produce 5500K white light. Please can you advise if 6500K daylight bulbs would also be ok? 6500K daylight bulbs should be ok too, yes. Just make sure you set custom white balance in your camera before you take the shots. But if you buy brand new bulbs, better go for 5500K. Hi Andrew, thanks for the fast response! For now I am actually using the camera on my iphone 4s and the results haven’t been too bad, even with the non daylight bulbs I have been using, but this means I can’t adjust the white balance. I will see how I get on with the daylight bulbs but after reading your articles I am toying with the idea of trying out one of the DSLR cameras you mentioned as they look more affordable than I had expected.. Im just unsure if the lenses they come with would be suitable for my product needs or if I’d end up needing a different more expensive one..
what kind of products you’re selling? I sell wedding related products, so table & venue decorations & other accessories & gifts. Also party accessories & decorations such as paper plates, place cards & bunting. To be honest most of my suppliers provide images which I am happy to use in most instances, but a handful of their images are not good enough so I would like to take my own. Plus one supplier doesn’t provide images at all which means as yet I have been unable to stock their products. Their products are mainly small, I would say ranging from 3cm to around 30cm. They are vintage style products made from a variety of materials such as painted wood, fabric, ribbon, card and porcelain with other materials such as string or metal wire for hanging on some of them..
for products like these, a macro lens really works best. So if you buy a new DSLR, buy body only and purchase a separate macro or tele-zoom with macro function lens. I read your post. If my product is pretty large, would it work if I taped two rolls of construction paper together to expand the width or would that create an un-seamless paper? Does my white background material or paper have to be one complete piece by itself or can I tape things together? Great post Andrew. I’d love to have a chat with you about possible opportunities around product images – could you drop me an email please?